Wheaton Precious Metals' increased focus on gold is a move in the right direction. After a double-digit run-up in the last quarter of 2017, shares of Wheaton Precious Metals (NYSE:WPM) dealt a heavy blow to investors when they nosedived in February alongside the broader market. The sell-off was clearly overdone, as the stock soon bounced back to regain all of its losses and more, swiftly closing the gap with peers Franco-Nevada (NYSE:FNV) and Royal Gold (NASDAQ:RGLD). As of this writing, Wheaton's up nearly 16% from its February bottom. Does that make Wheaton Precious Metals stock a buy at current prices? Because silver contributes a major chunk to Wheaton's revenues, declining silver production for the better part of 2017 kept investors on tenterhooks and drove the stock lower. Note that production here doesn't mean extraction of metals, as is typically the case with gold and silver miners. Wheaton, Royal Gold, and Franco-Nevada are precious metals streaming companies, which means they buy metals from third-party miners at discounted prices under streaming agreements in exchange for funding the miners upfront. In other words, these companies' sales are hit if their mining partners face production hurdles. Last year, for example, lower production from gold miner Goldcorp's Penasquito mine hit Wheaton and Royal Gold, both of which have streaming agreements with Goldcorp. In March, Wheaton lifted investors' hopes when it reported production of 28.6 million ounces and 355,104 ounces for silver and gold, respectively, for fiscal 2017, topping its guidance of 28 million silver ounces and 340,000 gold ounces. In May again, Wheaton reported a 11.7% year-over-year jump in silver production for its first quarter, thanks to higher production from First Majestic Silver's (NYSE:AG) San Dimas mine. Now for the bad news: Wheaton projects its silver production for fiscal 2018 to be only around 22.5 million ounces, or down almost 21% from last year. Why is that so? Ironically, San Dimas is largely to blame for any decline in Wheaton's silver production going forward. You see, San Dimas was earlier owned by Primero Mining, which was recently acquired by First Majestic. Under its streaming agreement with Primero, Wheaton was entitled to buy "a per annum amount equal to the first 6 million ounces of payable silver produced at San Dimas and 50% of any excess." Though San Dimas could never scale up because of operational and financial concerns at Primero, it still contributed 5.4 million ounces in average every year, or nearly 10% to Wheaton's total silver production, in the past three years. With the Primero streaming agreement no longer valid, Wheaton's silver sales are bound to fall. All's not lost for Wheaton, though, as there are three major angles to this story investors should know. 1. It's a near-term loss: While the loss of the San Dimas silver stream should hurt Wheaton, an expected uptick in production from other partner mines, such as Goldcorp's Penasquito, in the coming months should plug the gap. That explains why Wheaton projects its average annual silver production to be around 25 million ounces over the next five years versus only 22.5 million ounces in fiscal 2018. 2. Stake in First Majestic: As part of its new streaming agreement, Wheaton acquired 9 million shares of, or a roughly 11% stake in, First Majestic with a six-month holding period. Subject to regulatory restrictions, Wheaton can cash out the shares when needed. 3. Gold right on San Dimas: This, by far, is the most important development. After terminating its Primero agreement, Wheaton struck a deal with First Majestic and secured the right to purchase 25% of the gold and gold equivalent to 25% of the silver produced, converted to gold at a fixed gold-to-silver ratio of 70:1, from San Dimas. For each gold ounce, Wheaton will pay the lower of the spot price or $600, adjusted by 1% for inflation. That should ensure healthy margins on the stream. The gold agreement on San Dimas is also a big step forward in Wheaton's strategy to expand its gold portfolio. Unlike some years ago, when Wheaton was primarily a silver play, it now offers near-equal exposure to silver and gold. The gold leap is a smart business move, considering how high exposure to the yellow metal largely drove Royal Gold's and Franco-Nevada's cash flows over the years. 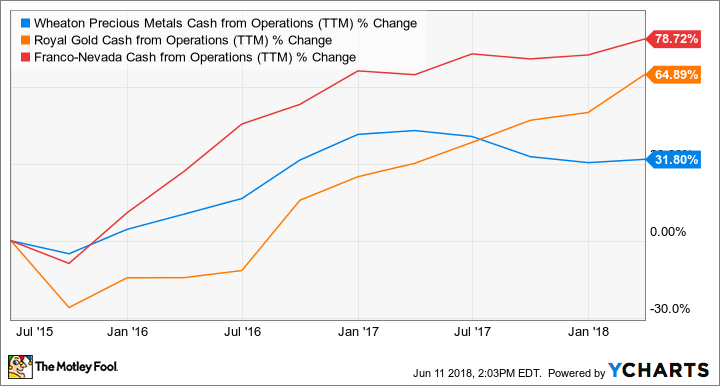 WPM Cash from Operations (TTM) data by YCharts. Wheaton expects its fiscal 2018 gold production to be similar to last year's at around 355,000 ounces, but it projects gold production to average 370,000 ounces every year over the next five years, thanks primarily to its agreements on Vale's Salobo mine and First Majestic's San Dimas mine. That means Wheaton's numbers will likely be muted this year (on the back of lower silver and flat gold production versus 2017), which doesn't quite make the stock a bargain at its current valuation of 18 times price to cash from operations. Yet, Wheaton continues to deliver solid cash flows, and the stock's still cheaper than Franco-Nevada and Royal Gold. The company should be able to deliver on its gold investments, which, I believe, should translate into strong returns for patient investors.